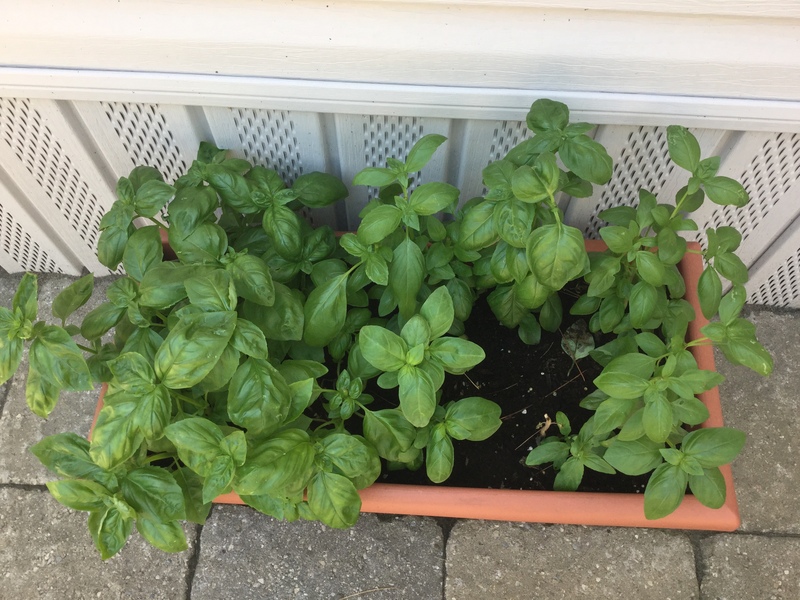 Pesto…. The Fresh Taste Of Summer. Every year we plant an abundance of herbs in pots on the deck at the cottage. Funny, they love the heat and they don’t complain about being crammed into pots. They actually do very well. There’s nothing like going out with the scissors and “harvesting” the fruits of your labor to turn ordinary into extraordinary! 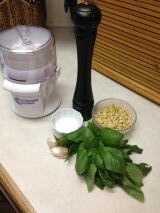 This year the Basil is particularly productive so we thought why not make some Pesto for dinner tonight. Pesto is so versatile as an ingredient. No longer do we just make pasta with it. No sir, we put that “S**t” on everything. Try spreading it on the bread for your next Paninni. Sublime. We’ve also made Pesto Pinwheels as appetizers. It’s also marvelous spread on a chicken breast once it’s almost grilled. Try it on tomato slices as a cool side dish. As we said, we put it on everything. 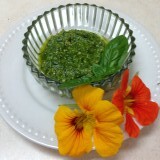 Traditionally Pesto is made using basil, garlic, Parmesan cheese, toasted pine nuts, olive oil, salt and pepper. We’re going to share that recipe with you here. But for the more adventurous types we suggest trying other non-tradational combinations. We love avocado oil and sunflower seeds as a substitute for the olive oil and pine nuts. One of our friends uses arugula in place of basil for a peppery bite. Try walnut oil and toasted walnuts with some flat leaf parsley added to the basil. Go ahead be brave! Experiment with Italy’s hard cheeses too. Have you ever tried Grana Padanna? Trust us it’s just wonderful. 1/4 Olive oil or enough to make a nice loose paste. Place everything into a food chopper and blend until just incorporated. You want texture not a puree. Add just enough oil to make the pesto run off a spoon. When Elfie gets into her “Julia Child” mode, she makes it in her Mortar and Pestle. It takes a bit longer but I’m sure I can taste the love she puts in it! Cooks Tip: When using the pesto for a pasta dish, boil your pasta and reserve a bit of the pasta water. Place the drained pasta onto a pan, add the pesto and thin it down just slightly with the reserved pasta water. pasta keeps absorbing moisture while you are eating and this helps avoid it becoming dry. Grate some fresh cheese on top to finish. We hope that you take the bounty of Summer to create a fresh tasting meal using this simple yet oh so delicious sauce. Bon Appetito!